Previously Table Mtn SE Top in MV. Camenabologue SE Top is the 175th highest place in Ireland. 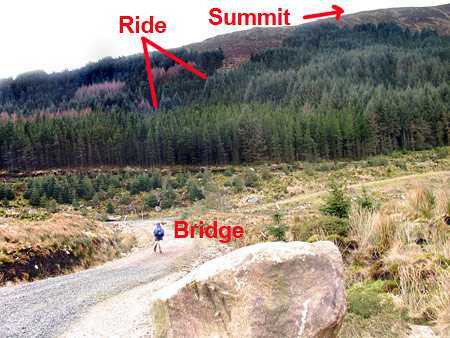 Although I have walked in Wicklow for hrumphty years I can't recall trying the delights of this summit. There's many a well-worn and classic route that passes near it but not over it. My visit was occasioned by a howling March gale with shot-gun hail in sustained bursts. One thing you can say for this place is that there's little sign that anyone else climbs it either though quite a few have logged it as one of the places they have climbed. The summit is marked by a small cairn on top of a peat-hag. Curiously there is another, larger cairn 150m to the SE of the summit. I would guess that on a good day you would get an interesting view down Glenmalure showing much of its length (the longest glacial valley in Ireland). One way up is as follows. Start at the Boravore car park. Walk up the valley past the An Oige hostel, past Ben Leagh to find the newish forestry bridge which is a substantial masonry construction over the Avonbeg River at T04449 95585 F around 2.8km from the Boravore carpark not shown on the OS map as of 2006. This is a useful bridge to know about incidentally because various routes can be constructed using it.